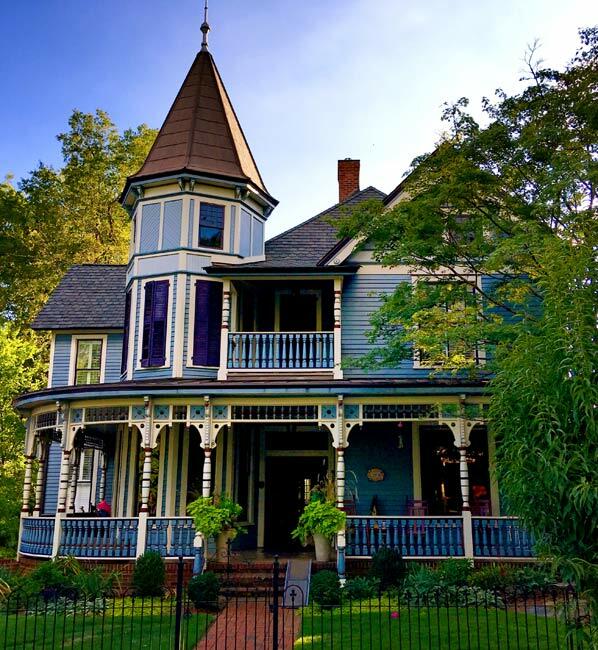 This Queen Anne home in downtown Greenville was built around 1894 for J.M. Geer. The Hampton-Pinckney neighborhood where the house stands grew by leaps and bounds at the turn of the twentieth century following the establishment of a trolley system in the area in 1901. In 1898 the home was sold to G. Heyward Mahon, who relocated to Greenville that year from Williamston. Mahon went on to serve as mayor of Greenville from 1903 through 1909. His son, G. Heyward Mahon, Jr., served in the United States Congress from 1936 through 1939. The J.M Geer House is noted for its eye-catching turret with a conical metal roof. Though the home has undergone multiple restorations, it maintains the integrity of its original design when built in the late nineteenth century. The Hampton-Pinckney Historic District is one of the oldest existing residential neighborhoods in Greenville. Architecturally it is representative of various styles and stages in Greenville’s development. The Hampton-Pinckney Historic District is recognized as Greenville’s finest remaining area of Victorian architecture. It contains a wide variety of Victorian housing styles and was the home of many prominent Greenville businessmen and local community leaders. It also contains three church structures. The district now encompasses seventy structures dating from ca. 1890 to ca. 1930, with the exception of the McBee House (ca. 1835). The architecture of the Hampton-Pinckney Historic District includes Italianate, Greek Revival, Queen Anne, various bungalows, and examples of Gothic Revival and Colonial Revival design, as well as vernacular forms. According to the National Register and other trustworthy sources it appears as Geer. Hope this helps, thanks! Was the builder of this home Jesse McArthur GEERS or GEER? I thought it was GEERS.